Sophie Shevardnadze: Haider al-Abadi, former Iraqi Prime Minister, welcome to the show, it’s great to have you with us on our program today. So, Mr. al-Abadi, Donald Trump has recently said that he wants the US troops in Iraq to “watch Iran”. Obviously, that’s caused an uproar with Iraqi politicians are condemning Trump in unison, but can Iraq really do anything about it, can they dictate terms to Washington? 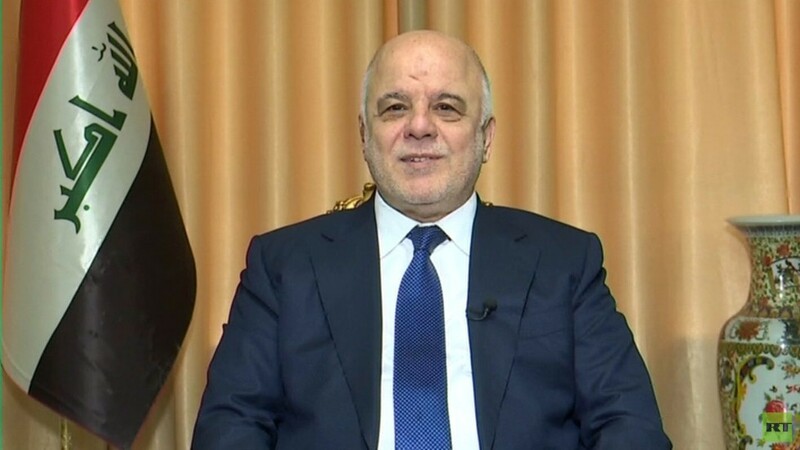 Haider al-Abadi: This is very unfortunate because there is an understanding, an agreement that the existence of foreign troop including US forces here in Iraq is to help the Iraqi government fight terrorism. It’s not a job of foreign troops to spy on our neighbors or use Iraq as springboard against our neighbors, this is not allowed in the Iraqi constitution and this is not part of the whole operations. The number of US troops in Iraq are limited, they don’t have free movement in Iraq, they have to move with the consent of the Iraqi government, they don’t have barracks of their own, they don’t control the sky, any flight in Iraq our outside Iraq should be by the agreement of the Iraqi government. So, I think the whole thing is outside the scope of the relationship between the two countries. This is very unfortunate. SS: Can Iraqi forces maintain security on their own if Baghdad shows America the door? HA: Well, Iraqis gave a lot of sacrifices to fight Daesh, the people who fought on the ground are only Iraqis. Yes, we received support from our allies, from the international coalition and from the rest of our friends in terms of logistics, training and providing some air cover to support our forces. But a natural fact? The only forces who are fighting on the ground are Iraqis. Yes, we can sustain this on our own, but I think this is not right. Terrorism is an international phenomenon, and Daesh is an international terrorist organization, who not only have threatened Iraq but the region, the whole world. So, it is right for the countries to cooperate, to face this enemy and to quash them. And I think we have to work together, so yes, we have to work with others in order to get rid of this terrorist organization all together. SS: The head of a Shia militia group said that the Iraq has capabilities to expel the US troops if needed. Are the Iraqi militias fired up enough to actually come to blows with the US forces in the country? HA: Well, according to the Iraqi constitution there is no place for militias in the country. By militias I mean armed groups who are outside the control of the state, this is against the state and the Iraqi people, and should not be allowed. We did not allow it and we will not allow it. If there are regular elements? Acting outside the state, they will be the enemies of Iraq and they should not be allowed outside Iraq. As opposed to the other armed groups who are within the state. We have the army, we have the police, we have the public mobilization force who have been now organized by the law which is legislated by parliament, which is applicable now to the public mobilization force, who are within the framework of the Iraqi security apparatus and they are answerable to the commander-in-chief and to the rest of the security apparatus. If you ask me do we allow elements who are outside the control of the state to act in Iraq – no, we shouldn’t, this is against the Iraq constitution and the will of the people and it’s not allowed in Iraq. SS: The calls for the US withdrawal were also sparked by the fact that, during his surprise visit in late December, President Trump didn’t bother to meet any Iraqi officials. Is this insult something that could have long-term repercussions for US-Iraqi ties? HA: Well again, according to Mr. Trump this is his well? He wanted to visit his troops during Christmas time, this is his own decision. On the other side, the Iraqi government gave permission to Mr. Trump to visit his troops in the Al Asad barrack in Western Al Anbar. In my opinion this was not organized properly, I think from day one it should have been organized in a way for Iraqi government officials to meet the President of the US when he comes to Iraq, and the meeting could have been done in Iraq, but It may be mismanagement which has led to this. This was unnecessary at all, it has poisoned the relationship slightly, but I hope we should move forward and forget about it. HA: This has happened to politicians in every country. They look at the day today running of the country and, of course, they want to attract support from their constituents. I think at the time it’s true that our allies stood with us to fight our enemy – the terrorists – but that doesn’t mean you give a blank cheque to whoever has helped us. Yes, we have to be grateful for those who stood with us, but at the same time Iraqi sovereignty is very important, and the war is over. If there is no need for the troops to stay with us, then there is no need. But if there Is a need we should think it over, we should discuss it in our parliament with the government with our political blocks and we should decide what is the best for Iraq. At the end of the day what we are going to apply is what is the best for Iraq and we don’t have any hostility to those who helped us to get rid of Daesh at all. SS: Turkey has bases in northern Iraq set put during the time of ISIS war from which it fights the Kurds. Now, we hear Iraqi politicians protest the American presence very loudly, but not being so vocal about the Turkish bases. Where’s the outcry from the Shia militias about that? Is the Iraqi rhetoric condemning Americans just an attempt to look tough and anti-US for the voters, maybe? HA: I think it has become like a war of proxies. You know, there is hostility between US and Iran, it’s a matter of proxies in Iraq where every side is using their proxies in their fight against each other. Yes, I agree, there are a few Turkish military bases, some of them date back to the days of Saddam Hussein when he was in power in the 80’s during the Iran/Iraq war and later on. Of course, we should not accept any military existence of foreign forces without the consent of the Iraqi government. In my opinion, I agree with you – we must be partial on this, we shouldn’t be double-standard, but, after all, we are part of this region and the disagreement between states – especially between Iran and the United States – it has its impacts on us. My call on my colleagues and the political establishment here in Iraq is we should confine our interests for the people and for our sovereignty. We should not be part any proxy towards this or that. SS: Back in 2017 you announced victory over ISIS in Iraq. But ISIS attacks still happen every day in the country, and the group still holds a chunk of desert in the north-west. Was your optimism, shall we say, a little premature? How long before ISIS is rooted out completely, if that’s ever possible? HA: Yes, if you go back to 2017 I was very careful. I said we crushed Daesh militarily, we liberated all our land. Daesh doesn’t hold any territories at Iraq. What they’re holding is some territory in Eastern- and North-Eastern Syria which is bordering Iraq, which is very dangerous, because they are given a chance they can go back to terrorism. At the moment, the extreme and danger of Daesh is that they’re trying to wage some terrorist attacks against the civilians inside the Iraq city. They haven’t succeeded yet. We quashed them, we strengthened our intelligence at the time. There is a fear that Daesh is concentrating on another campaign of terrorist attacks against civilians, and I hope our military, our security and intelligence are up to it, then they should carry on with dismantling this very dangerous terrorist organization. This is not just against Iraq, it’s against the whole region, against the world if they’re given a chance. So, we should stay focused until we eliminate this terrorist organization altogether. SS: The US has a relationship with Iraq, and neighboring Iran has a relationship with Iraq, but the US and Iran are rivals. Can Iraq maneuver between these two centers of power and keep its own independent agenda intact, or will it have to choose sooner or later? HA: I think our choice is clear. We happen to have the longest border with our neighbor Iran, the US doesn’t happen to have a border with Iran. I’m sure if they had they would have felt differently on how to deal with Iran and how to treat Iran. When you are a neighbor to another state you have to look at your interests and the common interests between the two nations. We cannot move away from our neighbor, they cannot move away from us. So, there’s a huge interest, there’s history, there’s trade, there are a lot of amalgamating interest between our two nations and our two states. We have to safeguard our own interests, we shouldn’t be party to this disagreement and this polarization of relationship, it’s got nothing to do to be honest with you. This is a nuclear agreement between the five plus one members of the world community and the Iran, and the US has decided to walk out of it, and why should be a part to this? We should be concentrating on our relationship with Iran which is very important to us, our relationship with the US is very important to us. We can achieve a common interest between the two and we should be very much focused not to allow any party to drag us along the wrong direction. SS: The militias fought ISIS with Iran’s help - advisors, military equipment, all that. The Americans keep saying that this is all Iran’s influence tools in the is that so? HA: I have to be clear on this – we didn’t have any Iranian fighting force on Iraqi territory. All we had we dealt with the rest of the countries, we purchased arms and we got advisors and trainers to our forces. We needed that, because if you remember 2014, Daesh rolled into Iraq which led to them gaining control over a large territory of Iraq, some of our army and security divisions have collapsed, so we have to seek support, training and other logistical support from other countries, and we did this. This doesn’t give influence to this country or that, and we hope it doesn’t. We have to be careful here in Iraq, we don’t want to lost our sovereignty while fighting Daesh. We did fight Daesh, we want to get back our sovereignty and we have stress that this is in the best interest of ours and of our neighbors and the international community. We are very focused on this. Now, if the US sees this as an Iranian influence, I disagree with them. The Iranian, unfortunately, look at the US presence in Iraq as again “This is US interests trying to drag Iraq into the other direction of being against Iran”. We shouldn’t be against Iran, we are not against the US, we are against interfering into our own, of affairs. We are pro-Iraqi interests or mutual interests between Iraq and the rest of the world. SS: The rise of ISIS was largely fueled by the grievances of the Sunni population against the government. Could the current empowerment of a largely Shia armed force, on that’s difficult to control result in more Sunni outrage? HA: Well we shouldn’t revert back to sectarianism which was a disease and which really has led Daesh to being able to run over a large territory of our own country. I think we have succeeded to reestablish our security forces, our armed forces as a national force, which are now trusted by our population at large, including the population in the liberated area. We are happy with this and we should continue along this. Now, any deviation from this is very dangerous. This can danger and can threaten our own nationality and can lead to another upheaval. I have been very careful during my term as Prime Minister – I was Commander-in-Chief – to make sure that the security forces and the armed forces are serving the population, protecting them and they belong to the population. There is no sectarianism or ethnicity in our arm forces, they belong to the country and they are its protectors. They are the national heroes who liberated these areas and they should stay as they are. I agree with you, if there are militias outside the state or try to act outside the state, this is very dangerous because this will give rise to another terrorist organizations and we should all be united against it. SS: Quite recently, the UK pledged the equivalent of 40 million dollars assistance package to Iraq to bolster its economy and reduce its reliance on Iran, as the UK’s Middle East Minister put it. But the trade between Iraq and Iran runs into the tens of billions of dollars, can 40 million make a difference? Is there truth to that, how dependent is Iraq on Iran in terms of its economy? HA: It’s not dependence. I think there are two neighboring countries, that is in our benefit and in their benefit to have trade between the two countries, and we cannot stop this trade, the majority of this trade is by the private sector, and I don’t think it’s the job of the government to stop the private sector from being active. This is a benefit to our own citizens, to our own private sector, and a benefit – again – to the population of Iran. This a mutual interest, we should encourage it. As to the payment – of course, as I said on the press conference when I was Prime Minister – we cannot deal in dollars because the dollar is the US currency, and the US Federal is controlling that currency, so neither us nor the Iranians can use that currency between us. We can use other currencies, Europeans have developed some tools which we can utilize to avoid the sanctions against Iran. I think we are abiding by our own interests and the interests of the rest of the sates. We don’t want sanctions to be applied against Iraq because this would be very harmful to Iraq. We are to protect Iraqi interests on this, but, at the same time, we are not acting as a proxy for this country to apply sanctions against another country. We are not a part to this and we shouldn’t be. SS: Why are Iran-Iraq economic ties such a concern for the UK and the US? Why do they care so much? HA: Well, I think they have a problem with Iran and the Iranian revolution from day 1. And although it’s been more then 40 years, there still is a problem. They have a problem with Iran, they want to contain Iran, and they think any relationship with Iran is harmful to them. But, of course, every country is right to look at their own interests. We should look at our own interests as well. I think, countries compete with us to achieve their interests and we should compete with others to achieve our own interests. SS: When you look at it on the other hand, do you think Iraq actually benefits from these tensions between Iran and the West, from the situation where everyone is interested in buying influence? I mean, those subsidies will come in handy, don’t they? HA: I’m not sure about this. I know competition is good, but conflicts are bad. Conflicts will lead to the loss of your own resources. Look at our country. It was rich, it was developed. Look what the previous regime has done, it has involved us in wars, into regional conflicts, and we lost a of of that – our wealth was lost. As a matter of fact, our own wealth was destroyed by our own country. We don’t believe in conflicts – we believe in competition. Competition is healthy and good. If it’s done according to the right rules of bilateral relationships and respecting sovereignty. We don’t mind competition, in fact we welcome it – but we are against conflicts. Conflicts cause war,loss of resources, and we don’t want to be in that again. We are not part of this. SS: Iraq continues to be one of the most corrupt countries in the world, and former Iraqi national security adviser Mowaffak al-Rubaie told me that corruption taints all levels of government, all areas of politics. Now, current PM Adil Abdul-Mahdi has re-established the Supreme Anti-Corruption Council. What are the guarantees that this body won’t be mired in the corruption itself? HA:This is very important, this really was established during my term. I had the last meeting in April 2018, and I think the current Prime Minister carried on with it with some modifications to it, which I think is very good. It’s important to have some apparatus which will oversee how we should combat corruption. You have to combat it by making people aware, by enlightenment, by education, by enacting new laws, by bringing all resources to fight corruption. I think the worst kind of corruption is political. Political parties take part in that corruption, they use their position in their state to advance their own interests against the interests of their people. This is very dangerous. We have to make sure that we cleanse our own acts as politicians in Iraq and we should do the utmost to stop this corruption. Corruption is a culture. If you don’t stop this culture, you cannot find corruption. You have to put the right procedures to fight corruption. They shouldn’t be used against political enemies, this will lead to the wrong thing – in fact, it will lead to more corruption. I think we should be very partial – those who are in power should be very partial in fighting corruption, they have to fight the essence of corruption. We have started this procedure. I will take time till it achieves the result. I hope the current government will be successful in fighting the core of corruption, and the results will appear later. SS: It was during your tenure when Kurdistan voted to become independent from Iraq in 2017. You called the referendum results void and imposed a flight ban over the region back then, and so the declaration kind of just fizzled out. If the independence talk makes a comeback in Erbil, will Iraq commit to military action to bring the Kurds back into line? HA: Well I think we are partners in this country. And when you take a decision as partners, you have to consult the other party. It’s not right that you take a unilateral action. We’re living in the same country, in the same region, we have many ties. My answer to our Kurdish partners in this country is that we should work together. If you want to achieve positions and get power and get benefits so that you work towards independence – it doesn’t work, because this will not establish trust between the Kurdish region and the rest of Iraq. You have to establish trust. You have to decide if you are a part of this nation, a part of this country, you have to take that final decision and then we’ll move forward. Then we are partners in everything. SS: Kurdistan’s PM Nechirvan Barzani he told me that Baghdad neglects the needs of the Kurds, that it doesn’t treat them fairly in the federal state. Should the Kurds expect any change in Baghdad’s attitude towards them now? HA: I think this is the solution, as I said. I think there is no way other than coming back to Baghdad for all Kurdish citizens. I think they have been very eager to build a relationship with our neighboring countries, but our neighbors don’t encourage establishing a Kurdish state, because they don’t allow independence or even semi-autonomous Kurdish region in their own country. But in Iraq we allow it, they have their autonomous region and we are working with them within the framework of the federal state. The federal state has got this zone authority and the regions have their own. We shouldn’t weaken the federal authority on the account of the region, and we shouldn’t weaken the regional authority on the account of the federal. That’s how we worked it out, and I think we have been very successful at the end of 2017 and 2018. We just reestablished a relationship, we opened the airports in the region of Kurdistan, we opened the trade again and I think we have to build along these lines. Going back to the referendum and trying it again, it will backfire, I can tell you. SS: Thank you very much for this insight. We were talking to Haider al-Abadi, former Prime Minister of Iraq, discussing the fragile balance of powers in the country.